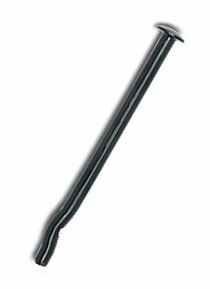 PRODUCT: 1/4" X 4" ROOFING SPIKE / CONCRETE ANCHOR, MUSHROOM HEAD, PERMA-SEAL COATED CARBON STEEL. 500/BOX. PRICE/BOX. Designed especially for roofing applications, the SPIKE® is a one-piece, vibration resistant anchor available in 3/16" and 1/4" diameters. Use to fastening insulation, single-ply membrane, wood, and metal to structural concrete roof decks. Perma-Seal™ proprietary fluoropolymer which meets the corrosion resistance requirements of FMRC Standard 4470. FM Global approved for structural concrete decks, fully adhered single ply and modified bitumen coverings. It is designed for use in conjunction with Powers insulation or membrane stress plates and most others. ASTM B633 SC1 Type III Grade Zinc plating meets the corrosion resistance requirements. Material: Grade 8.2 carbon steel.